Dinachem is a hybrid feminized sativa-dominant feminized Marijuana strain being the most advanced version of the famous Chemdog. Potent high with high therapeutic value having a strong Chemdog flavor. Dinachem is a hybrid feminized sativa-dominant feminized Marijuana strain being the most advanced version of the famous Chemdog. 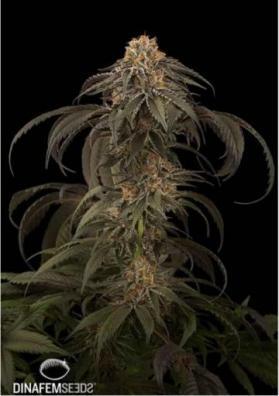 Dinafem Seeds worked in strict collaboration with ChemDawg, the breeder of the original Chemdog. In this collaborative work, they crossed the original seed with various selected seeds of GuavaChem in order to introduce a new vigor and productivity and to retain the pleasant lemon and gasoline taste combined with a hint of pine of the original Chemdog. 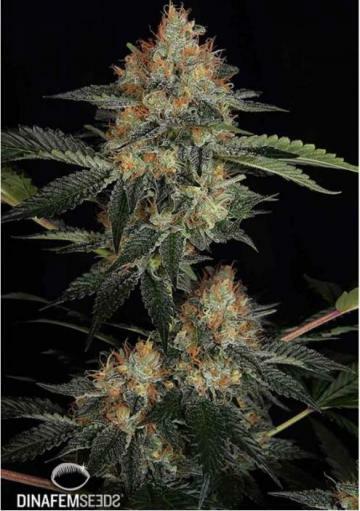 This work has resulted in an advanced and improved version of the original Chemdog, which keeps several famous characteristics but growing more vigorously. Like its parent, Dinachem is highly prized for its therapeutic properties and largely used to relieve corporal pains, stress and also to stimulate the appetite. This plant reach moderate heights. 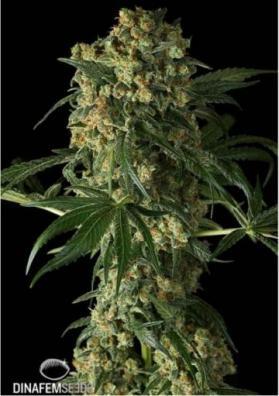 In the outside it can reach 2.5 meters high producing large and elongated buds filled with small orange and white hairs that can turn red, purple and yellow with and green chalices covered with a bright crystal resin. In a growing room you will have to wait 60 days to harvest it but after that time you will be able to get generous productions of half kilo per square meter. In the garden, you can collect it in early October.